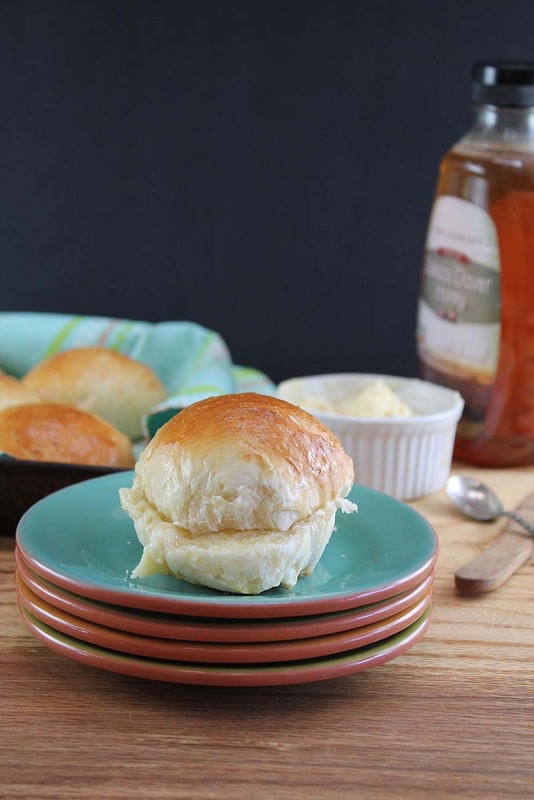 So you think you have no time to bake homemade dinner rolls? We think this recipe will change your mind! The dough is prepared before going to bed and rises slowly in a cold refrigerator. All you have to do the next day is shape, rise and bake! Have liquid ingredients at 80ºF and all others at room temperature. Place ingredients in pan in the order listed. Select dough/manual cycle. Do not use the delay timer. Check dough consistency after 5 minutes of kneading. The dough should be in a soft, tacky ball. If it is dry and stiff, add water, ½ to 1 tablespoon at a time. If it is too wet and sticky, add 1 tablespoon of flour at a time. At the end of the last kneading cycle, press STOP/CLEAR, remove dough and proceed with the directions under the Rising, Shaping and Baking section below. See our Bread Machine section for more helpful tips and information. Combine yeast, 1 cup flour, and other dry ingredients. Heat water to 120º to 130º F (very warm tap water). Combine dry mixture, water and butter in mixing bowl on low speed. Beat 2 to 3 minutes on medium speed. Add egg; beat 1 minute. By hand, stir in enough remaining flour to make a firm dough. Knead on floured surface 5 to 7 minutes or until smooth and elastic. Use additional flour if necessary. Continue with Rising, Shaping and Baking. Combine dry mixture water and butter in mixing bowl with paddle or beaters for 4 minutes on medium speed. Add egg; beat 1 minute. Gradually add remaining flour and knead with dough hook(s) 5 to 7 minutes until smooth and elastic. Continue with Rising, Shaping and Baking. Have all ingredients at room temperature. Put dry mixture in processing bowl with steel blade. While motor is running, add water, butter, and egg. Process until mixed. Continue processing, adding remaining flour until dough forms a ball. Continue with Rising, Shaping and Baking. Place dough in lightly oiled bowl and turn to grease top. Cover with plastic wrap or foil. Refrigerate 6 to 12 hours. The dough will need to be punched down in a couple hours. Remove dough from refrigerator, punch down, and allow to rest for 10 minutes before shaping. Divide dough into 4 parts. Divide each forth into 4 pieces and shape into rolls. Place rolls 2 to 3 inches apart on greased cookie sheets. Cover; let rise at room temperature until indentation remains when touched. Combine 1 egg and 1 tablespoon water; gently brush onto rolls. Sprinkle with sesame seeds, if desired. Bake in preheated 400°F oven 8 to 10 minutes. Remove from cookie sheets. Serve warm or cold. *Use Active dry yeast for this recipe. Instant yeast is not recommended for refrigerated doughs. Visit our Lessons in Yeast & Baking for more information on baking. This recipe is featured at Miss in the Kitchen. For the recipe of angel rolls and rich refrigerator rolls, what size baking sheet should be used? Use a 9×13-inch cookie/baking sheet. Enjoy the rolls!